Home NEWS Kiambu MCAs turn assembly into a "War Zone" over Ksh1 Billion Supplementary Budget. Kiambu MCAs turn assembly into a "War Zone" over Ksh1 Billion Supplementary Budget. 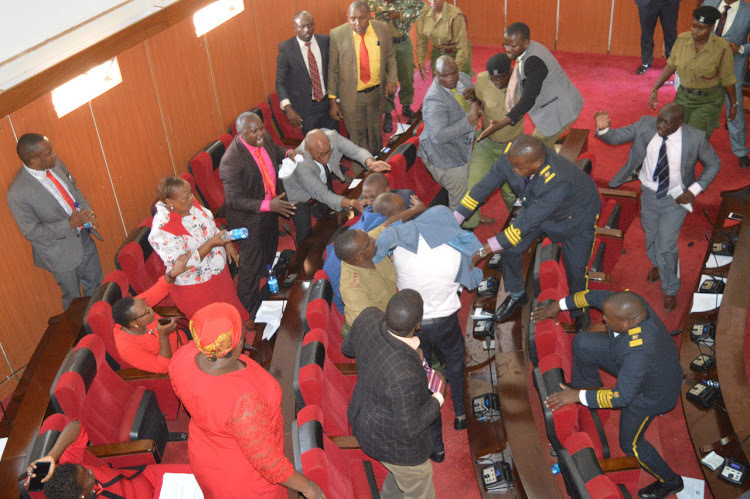 Business at the Kiambu County Assembly was interrupted on Thursday afternoon when Members of the County Assembly (MCAs) turned the chambers into a combat zone. Two warring factions clashed over a proposal to reconstitute the Finance Committee and increase the county’s recurrent expenditure by Ksh.1.2 billion in the 2019 supplementary budget. Hell broke loose immediately after Kiuu MCA Daniel Ngugi, who is the chairman of the Adhoc Committee on Finance, tabled the supplementary budget bill for debate. A section of the members protested the move, accusing Speaker Stephen Ndichu of sneaking the bill through the backdoor without following the house Standing Orders. The MCAs in the Budget and Finance committee questioned why the committee was split in a hurry. The committee had presented a report on the executive's spending. The report said money was misappropriated and the county Finance chief and the Finance executive had failed to honour summons to explain. “The Speaker is allowing breaking of house rules to introduce a document which has not followed proper procedures and we cannot allow that. We read a sinister motive of passing a document that has misappropriation of public funds,” said Kihara MCA Kabau Muthondu. The speaker was forced to adjourn the session after his efforts to bring the house to order failed, prompting the intervention of sergeants at arms. For more than 20 minutes, MCAs from opposing camps exchanged blows, turning the assembly into a war zone. Bottles of water were thrown across the assembly floor and water poured on the seats. Following the standoff four MCAs representing Ndenderu, Sigona, Ndeiya and Ikinu were suspended for three house sittings.